These Warmawear Heated Gloves are really affordable so I wanted to give them a try to see how they stand up to real life winter conditions. I hope you enjoy my review. Heated gloves are growing in popularity yet many people still can’t bring themselves to spend the kind of money required to purchase a top of the line pair of heated gloves. I decided to try out the inexpensive Warmawear Dual Fuel Burst Power Deluxe Battery Heated Gloves with hopes that people on a budget could still obtain significant relief from the discomfort most of us experience when our fingertips and hands get chilled to the bone during an outdoor adventure (or even when going out to run a simple errand). 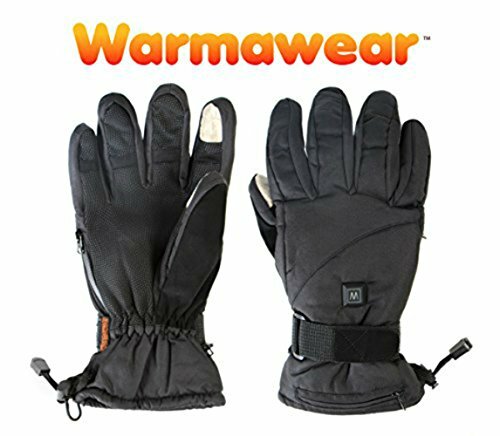 Warmawear makes a complete line of battery heated clothing and people who travel to cold destinations have reported satisfactory (or better) results from most of their products, so I was optimistic about the quality of these gloves. These gloves are extremely well padded and lined with a soft insulating material. The bulk does make it challenging to use your hands for much of anything with the gloves on, but for the purpose of holding ski poles, they were acceptable. The gloves contain a reflective lining that is supposed to retain both natural body heat and heat from the batteries and/or disposable heat packs which are the two heat sources that give the gloves their “Duel Fuel” name. As for the functionality of the electronics within the gloves, this aspect leaves much to be desired. The carbon ceramic heating elements do run all the way up to the fingertips, but they are located on the back of the hand where they seem to produce less of a warming effect than gloves with elements that run along the palm side. The company claims that the Burst Power feature is designed to cycle on and off in five second intervals after the initial heating period. Unfortunately, this feature seems to have reduced the overall functionality of the electronics within each glove. The heating function itself was extremely unreliable and the on/off switch had to be fiddled with frequently to get the gloves to deliver the heat they promised. When the elements were actively heating, the gloves did produce enough heat to make a difference, but only on the “high” setting which does not use the Burst Power feature. An excellent aspect of this design are the special pockets on the palm side of the gloves that allow you to insert a disposable heat pack. Although I’m not personally a big fan of heat packs as the heat doesn’t travel that far up the fingers, it does add an element of comfort to the gloves as a whole and keeps blood flowing within the hand region. I’m giving these a rating of 17/20 for comfort due to their bulkiness which limits the amount of dexterity you have with your hands. As for warmth, I’m giving them a 15/20 because they do have great insulation and the pocket for disposable heat packs is a very nice feature. Heat from the batteries, however, did not offer much of an advantage with these gloves. Being an entry level pair of heated gloves, high end materials like quality leather and Gore-Tex are distinctly absent. The outer fabric is water resistant, however, and did a decent job repelling moisture, even after several continuous hours of skiing. The reflective coating inside the gloves also seemed to improve their ability to keep my hands dry in addition to acting as an excellent source of insulation. Overall, these gloves deserve a rating of 18/20 for water resistance since the material does do its job but starts to wick moisture in extremely wet conditions. This is a reasonably well made pair of gloves with decent stitching, fabric and insulation. I never had an expectation that they would compare to my top picks, but for the price, the quality is quite acceptable. The electronics are highly disappointing considering these gloves are marketed as battery heated gloves. Warmawear has added a material they call Tecsense to the tips of the thumbs and forefingers on each glove to provide wearers the ability to complete basic tasks on their touchscreen devices without having to remove their gloves. In practicality, however, I did not find this feature to be effective and could not use my device with my gloves on whatsoever. The outside of the thumbs are covered in a scratch and smear resistant material containing microabsorbent fiber for the purpose of wiping glasses or ski goggles. This is a nice touch which shows an aspect of quality in the design. The joints are also elasticated which increases the amount of flex within the gloves and is especially important considering the bulkiness which already restricts dexterity. Considering the low price, I’ve decided to give these gloves a 14/20 in the overall quality category. The performance of the batteries and electronics within these gloves are by far the poorest aspects of their overall design. Seems like Warmawear may have cut a few corners in their new Burst Power Design, or perhaps they are just working the kinks out. Either way, as mentioned before, any heat that was generated from the batteries was sporadic and unreliable. I sure wouldn’t want to depend on them for warmth if I had a medical condition that resulted in pain in my hands when they get cold. Warmawear claims that the low setting will provide up to 3.75 hours of heat while the medium setting is supposed to keep generating warmth for 2.75 hours (with the aid of the Burst Power feature). The high setting, which does not utilize the Burst Power, is said to maintain warmth for 1.75 hours using high quality 9 volt batteries. During my trial with these gloves, I found that high quality, fresh batteries only produced heat for around 30 minutes. I surrendered to using the “high” setting exclusively because the lower two did not seem to work consistently and “high” seemed to generate just enough warmth to make battery use worthwhile. Unfortunately, I can only give these gloves a rating of 7/20 in the battery category, as it seems like Warmawear has much to improve in this aspect of the design. These gloves seem to fit true to size; I ordered a large (as usual) and did not need to exchange them for another size. That being said, Amazon currently offers free returns only on the large size, so if you are unsure of whether to go for a medium or large, you can try out the large and exchange them for a medium at no expense if necessary. If you have smaller hands and are unsure what size to order, Amazon will still allow you to exchange the gloves (provided they are in new condition) but you’ll have to pay for the return shipping costs. There is an adjustable Velcro wrist strap which creates a tighter fit and retains a greater amount of heat within the glove. When the gloves are used with batteries, the fit on the wrist does become quite a bit tighter as 9 volt batteries are rather bulky and the battery pouch itself is located in a less than ideal location above the wrist strap. Considering the relative uselessness of batteries with these gloves, I can’t say this was a big factor in fit. These gloves do have their strong points but Warmawear should really consider whether they wish to continue marketing them as battery heated since this seems to be the worst design feature of the product. The palm pockets for disposable heat packs work well and can also be used to store credit cards or cash – very handy and one of the nicer aspects of these gloves. You’re not going to be able to read a book or use your touchscreen device with these gloves on (owing to their bulkiness and the less than effective Tecsense material), but they do have enough insulation to keep your hands warm in most conditions, even without a battery (especially if you use them with a disposable heat pack). As long as you are not purchasing these gloves with an expectation that the heating components are going to compare with higher end products, you’ll likely be pleased and your pocketbook won’t feel appreciably lighter after completing the transaction. Thanks very much for stopping by today. Thank you for the information. What gloves do you suggest for someone who is cold in summer but works in below freezing temperatures? In that case I would go with a pair of heated glove liners because you can wear them on their own in the summer and you can add another pair over top of them in the winter for extra insulation. A good budget friendly option for that would be the SVR Unisex Glove liners. Hope that helps. Sorry to hear that. Where did you order them from? I don’t actually sell gloves I just review them. If I were you I’d be contacting the supplier.